After the munchkin woke up from his super long nap yesterday, I strapped him into the Ergo and we headed across the street to the Forest Park Farmer's Market. We are CSA (Community Supported Agriculture) members with a local farm, Red Fire Farm and every week we get our share of fresh veggies. Our pickup location is the tuesday farmer's market. I had always wanted to get a farmshare, but when it was just me and Mich it seemed like way more food than we would ever be able to go through. But now that we are a whole house-full of people it makes so much sense. Having the farmshare has been awesome. It encourages us to cook at home- which is healthier and cheaper. It gets us to try new vegetables and new recipes. I had never had kohlrabi before our farmshare. It helps support local famers and people in our community. 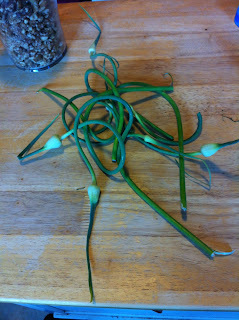 A cool benefit to our share is that we can actually go to the farm and pick our own veggies. How much and what we are allowed to take varies from week to week... but we are almost always able to get as much fresh herbs as we want. 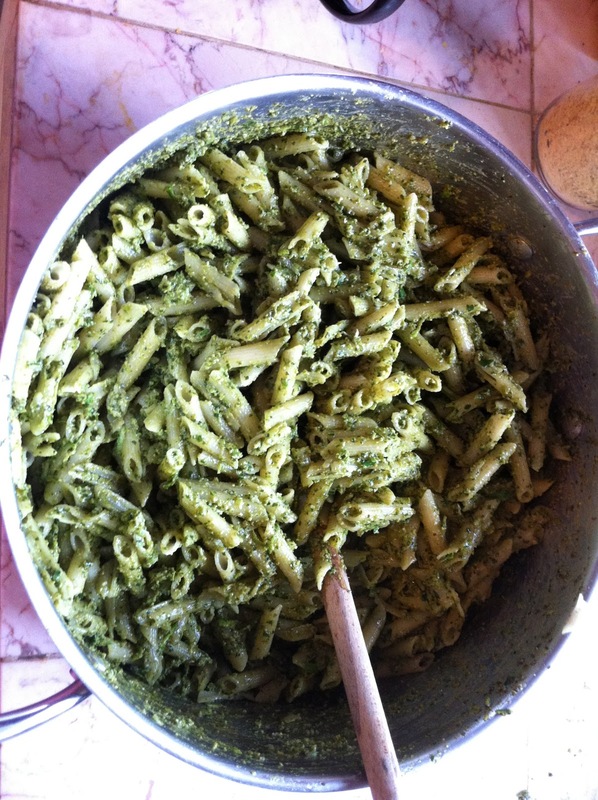 I made so much pesto last summer! yum. So the muchkin and I got to the market and headed straight to the Red Fire stand where we got our haul for the week. Cucumbers, Zucchini, Kale, Kohlrabi, Lettuce, Carrots, Basil. We had a really full bag of produce by the time we left the stand, so there wasn't much else to go buy. We picked up a little gluten free/ vegan chocolate peanut butter cake, some kettlecorn, some sweet cherries, and a fruit cup to snack on on the walk home. The munchkin had his swim lesson last night, he was not so thrilled this week, but he loved the slide at the end and kept signing more to go back on. The slide was the only time during the class that I think he smiled. The water was a little cool, so that may have has something to do with his reluctance. After class Michelle and I took him to a local mall where we ran a couple errands and them let him run amok in the indoor playground. He loves slides, but so far is only brave enough to go down feet first on his belly unless one of us is holding him. He is still asleep as I type this at quarter to 10am, but it meant a productive morning for me. I made some pesto and got a little knitting done. Plus I get to enjoy coffee without grabby little hands. Hooray for little luxuries. One of the best parts of the market- Fresh Kettle Corn! 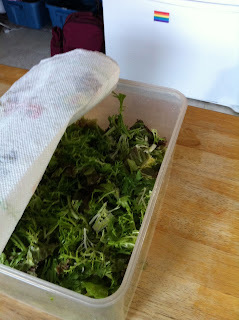 I am trying to get in the habit of processing all the greens right away, so that we have easy to grab salad mix. I want salads to be easy, and if I have to wash and chop lettuce when I want a salad, I'm going to grab convenient junk food instead. So now we have a big container of washed and chopped salad greens just waiting in the fridge. garlic scapes. I wasn't sure what to do with them and we've gotten a ton the last couple weeks so I put them in my pesto instead of garlic cloves. I think it came out really nice. mmm... pesto. I make my pesto with walnuts instead of pine nuts because I'm not a huge fan of pine nuts. 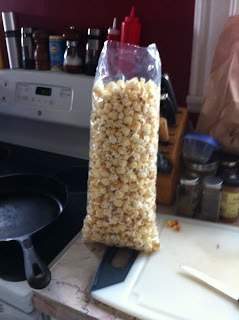 I also used nutritional yeast instead of cheese. yum. 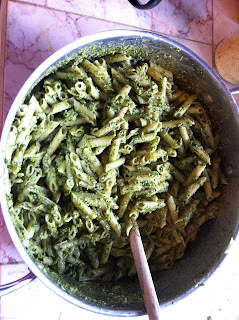 Vegan, gluten free pesto pasta salad... perfect for the 4th of July.